This book provides a comprehensive and systematic approach to understanding GARCH time series models and their applications whilst presenting the most advanced results concerning the theory and practical aspects of GARCH. 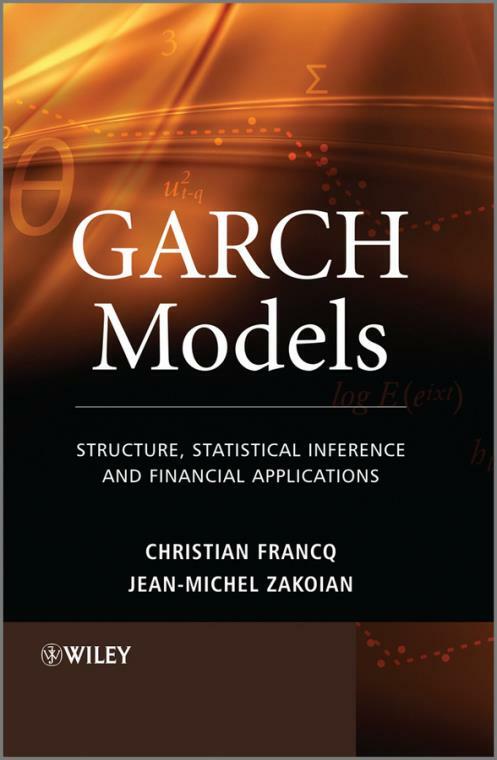 The probability structure of standard GARCH models is studied in detail as well as statistical inference such as identification, estimation and tests. The book also provides coverage of several extensions such as asymmetric and multivariate models and looks at financial applications. Provides up–to–date coverage of the current research in the probability, statistics and econometric theory of GARCH models. Numerous illustrations and applications to real financial series are provided. Supporting website featuring R codes, Fortran programs and data sets. Presents a large collection of problems and exercises. This authoritative, state–of–the–art reference is ideal for graduate students, researchers and practitioners in business and finance seeking to broaden their skills of understanding of econometric time series models. 1 Classical Time Series Models and Financial Series. 1.2 ARMA and ARIMA Models. Part I Univariate GARCH Models. 2.3 ARCH ( ) Representation. 2.4 Properties of the Marginal Distribution. 2.5 Autocovariances of the Squares of a GARCH. 3.1 Markov Chains with Continuous State Space. 3.2 Mixing Properties of GARCH Processes. 4 Temporal Aggregation and Weak GARCH Models. 4.1 Temporal Aggregation of GARCH Processes. 4.3 Aggregation of Strong GARCH Processes in the Weak GARCH Class. 5.1 Autocorrelation Check for White Noise. 5.2 Identifying the ARMA Orders of an ARMA–GARCH. 5.3 Identifying the GARCH Orders of an ARMA–GARCH Model. 5.4 Lagrange Multiplier Test for Conditional Homoscedasticity. 5.5 Application to Real Series. 6 Estimating ARCH Models by Least Squares. 6.1 Estimation of ARCH(q) models by Ordinary Least Squares. 6.2 Estimation of ARCH(q) Models by Feasible Generalized Least Squares. 6.3 Estimation by Constrained Ordinary Least Squares. 7 Estimating GARCH Models by Quasi–Maximum Likelihood. 7.2 Estimation of ARMA–GARCH Models by Quasi–Maximum Likelihood. 7.3 Application to Real Data. 7.4 Proofs of the Asymptotic Results. 8 Tests Based on the Likelihood. 8.1 Test of the Second–Order Stationarity Assumption. 8.2 Asymptotic Distribution of the QML When 0 is at the Boundary. 8.3 Significance of the GARCH Coefficients. 8.4 Diagnostic Checking with Portmanteau Tests. 8.5 Application: Is the GARCH(1,1) Model Overrepresented? 8.6 Proofs of the Main Results. 9 Optimal Inference and Alternatives to the QMLE. 9.2 Maximum Likelihood Estimator with Misspecified Density. Part III Extensions and Applications. 10.3 Asymmetric Power GARCH Model. 10.4 Other Asymmetric GARCH Models. 10.5 A GARCH Model with Contemporaneous Conditional Asymmetry. 10.6 Empirical Comparisons of Asymmetric GARCH Formulations. 11.4 Estimation of the CCC Model. 12.1 Relation between GARCH and Continuous–Time Models. 12.3 Value at Risk and Other Risk Measures. B Autocorrelation and Partial Autocorrelation. B.2 Generalized Bartlett Formula for Nonlinear Processes. C Solutions to the Exercises.